A lot of people shudder when they see growth projections of the Houston metro area from the current 6.5 million to 9 or even 10 million people over the next couple of decades. If traffic is this bad now, how can we possibly handle it? Is there any way this can be handled gracefully, or at least less painfully? I think it can be if we look at it with the right perspective, and I call that perspective “Snow White and the Nine Dwarves” (yes, even the fairy tales are bigger in Texas – I considered “Asgard and the Nine Realms” of Norse mythology, but I think that’s too obscure a reference for most people). If you look at a lot of modest-sized cities, they can operate effectively on as little as two crossing interstates/freeways. 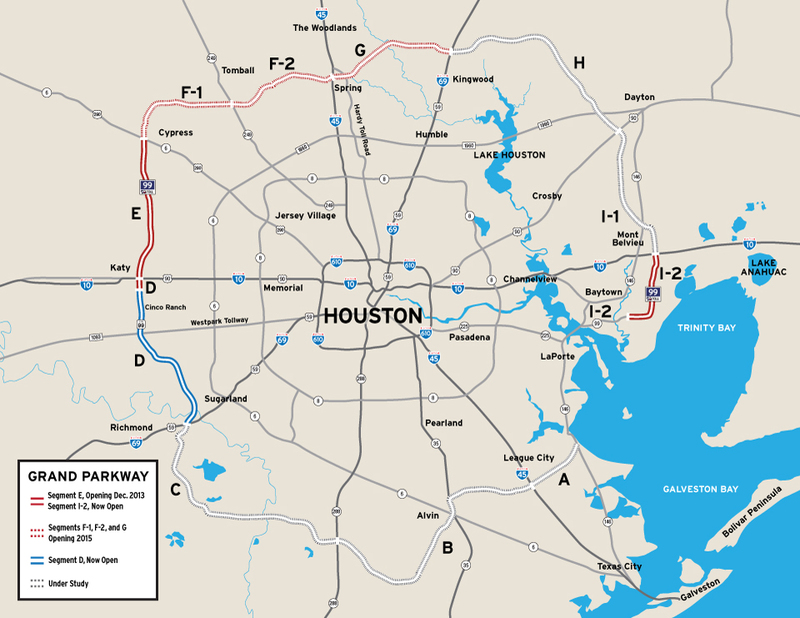 As you can see in this map, Houston’s rapidly growing Grand Parkway outer loop is creating many more of these crossings along our radial spoke freeways. I think each of these “villages” could comfortably grow to as much as a million people themselves, which, when added to 2-3 million in Houston, gets us as high as 12 million people in the metro area, almost doubling our current population and handling several decades of growth. Under this scenario, I would see much of the job growth increasing along Beltway 8, with workers with families commuting in from the villages and young inner loop singles commuting out, with both able to keep commutes under the magic half-hour limit (hopefully). As part of this vision, I think it would be good for Houston to encourage a healthy competition among the villages similar to the many hospitals of the medical center (and, um, how the dwarves competed for Snow White’s attention). In both cases, the friendly competition makes the overall entity stronger and healthier. Of course much of that comparative competition would be on quality of life amenities, but I think the most important competition among them would be cooperating with METRO to provide the best express park-and-ride services to the most job centers in the core (downtown, uptown, med center, Greenway, Energy Corridor, Westchase, etc.). That’s how this growth happens without traffic Armageddon, and it will be a big factor in which village those young inner-loopers choose when they decide it’s time to have a family and move out to the suburbs. I think The Woodlands has a clear lead in this competition and sets the standard for the other dwarves to aspire to – always good to have a role model to point to. This is somewhat similar to how DFW has grown over the last decades, although almost all of their villages/edge cities went straight north and northwest, which has shifted the metro’s center-of-gravity towards the airport and has not been very healthy for the City of Dallas itself. If Houston can encourage somewhat balanced growth among the nine dwarves, it will help the core stay healthy as well, since employers will want to stay there to be able to draw employees from the entire metro (not to mention the young inner-loopers) rather than commit to moving out to a single village like Exxon. No disrespect intended, but how is this material appropriate for Market Urbanism? This article projects the geographic possibilities of metro Houston’s sprawl, but does not seem to touch on urbanism or market economics. Am I missing something? The article is about the regional growth of one of America’s largest metros, and how it will effect Houston’s traffic, mass transit, competitiveness and downtown health. How is that not an urban issue? Or does the definition of “urbanism” stop right when one crosses city boundaries?